Odelia C. Roman was born 82 years ago in Brownsville, Texas and went to be with her beautiful God Nov. 12, 2018. A Memorial Service will be held at 10:30am Friday Nov. 16 at New Hope Baptist Church West with Rev. Randy Southerland officiating. Services are under the direction of Don Grantham Funeral Home. Odelia (Delia) had an enduring and profound love for her family. She is remembered as strong and fiercely loyal and nurturing to four generations of family members. As the matriarch of the Morales family she will be missed for the blessings her love bestowed upon them. 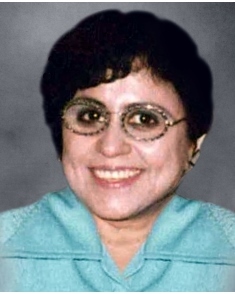 She is survived by her children: Alicia Morales, Margo Morales, Dr. Oscar Morales, Israel Morales, Patricia French, Jerry Morales and Rojelio Morales; a sister, Otila Cordova; her loving grandchildren: John J. Lorimor, Amy M. Hittle, Eric Hurd, Chris Hurd, Hope Michaelis, Abel Erives, J. Theodore Carson, Jessica, Jasmine and Jacob Morales, Ian Morales, Christian and Isaiah Morales, Joseph, Benjamin and Jennifer Morales; her spouse, Jose Pilar Roman and a step-son, Felipe Roman Valles; eight great-grandchildren; and many other loving family members. She was preceded in death by her parents, Alicia Infante and Valente Cordova; her daughter, Gloria A. Hurd; two brothers, Alberto and Valente Cordova; and three sisters, Olivia, Ofelia and Orelia Cordova.